Drip…. drip…. drip…. Do ya hear that? We see a lot of plumbing issues here at Stine-Nichols, but your typical faucet leak is definitely one of the most common problems we encounter. If you have a leaking faucet in your house, you might not think anything of it. It seems pretty harmless after all. When a sink is leaking, a lot of times it’s due to damaged or weakened parts. The washer, seal or cartridge probably just needs to be replaced. Fortunately for a skilled plumber, this is relatively simple and affordable to fix. Alternatively, you could also be looking at cracks in your plumbing. When a plumbing pipe has a crack or is loose, it can cause your faucet to leak. The problem is that most people don’t realize that they could be dealing with potentially serious water damage. If you notice your faucet has a slow but steady leak, inspect the piping underneath the sink. Keep in mind the leak could also be behind the walls… This is why we recommend having a professional plumber take a look. Does your faucet leak during specific times of the day, like at night or when no other plumbing fixture is being used? This could mean that your water pressure is too high, and it becomes a problem when no other faucets or plumbing fixtures are being used in your home. Small leaks can start in your faucet, eventually leading to pinhole leaks in the piping, worsening over time. You obviously know that you’re wasting water, but how much exactly? Check out this awesome water-waste calculator. 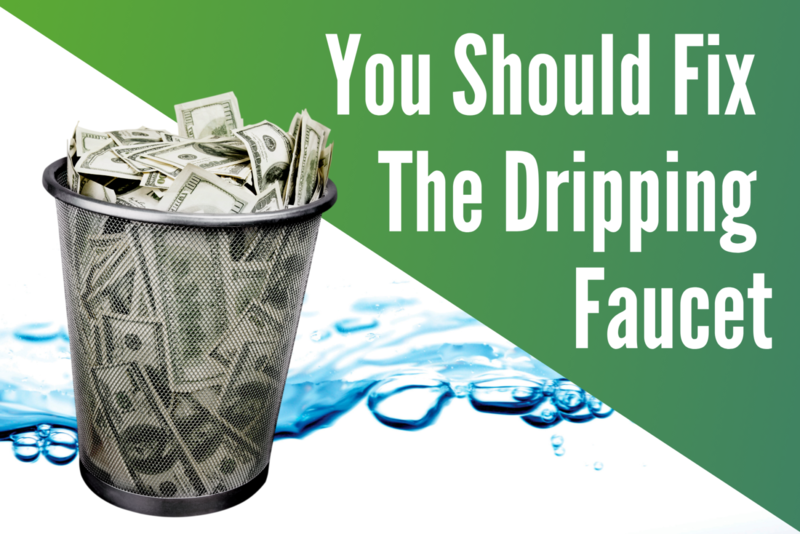 Let’s say that the average leaky faucet drips once every two seconds (aka. 30 drips per minute). Could you imagine drinking 2.85 gallons of water PER DAY? All in all, it’s best to not ignore a leaking faucet. Make sure you have it repaired immediately before it develops into a huge headache later. We never hope that you’ll need a plumber, but if you ever do, we would love to be your go-to expert.